Consumer adoption of solar is progressing. But is more education needed? The dog days of summer seem an appropriate time to ponder all things solar while trying to stay cool. To this end, it’s rather encouraging to note more states are embracing solar as part of their energy mix and even the White House takes advantage of it. I was curious to know if there was a map of solar installations in the U.S., and sure enough, I found an interactive one on the website for the Open PV Project. According to the map – and as I expected – there is a concentration of installations on the two coasts, but a large swath of bareness in the center of the country. Is solar a state of mind? I don’t want to assume solar is a “socially liberal” kind of thing, but looking at where the installations are gathered, it seems there is still educational work to be done in geographies that receive a lot of sun and have a lot of open space. Interestingly, if you look at the interactive map, it is encouraging to see how the installations creep inward from the coasts. 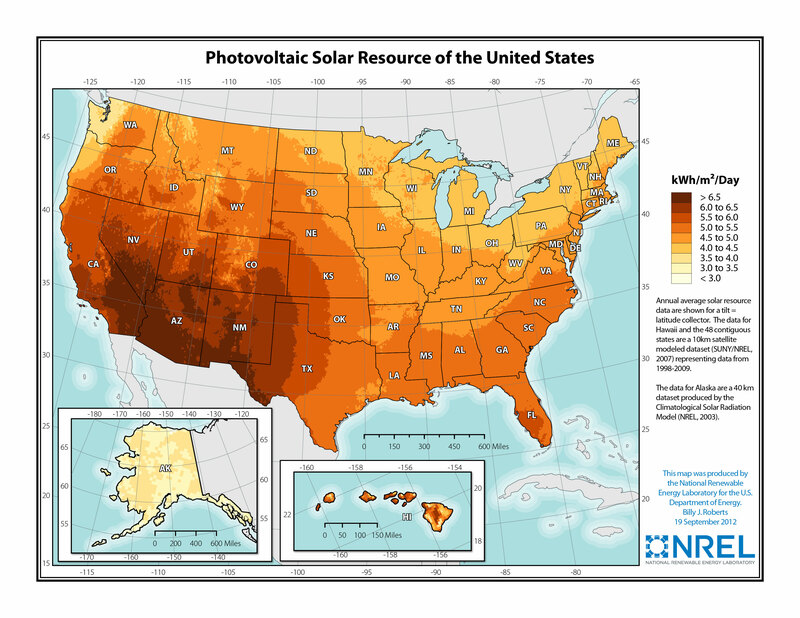 Looking at it from the perspective of kWh/m2/day, this map from the National Renewable Energy Lab tells a different story. As expected, the highest amount of solar energy is generated in the southwestern part of the country, and even though installations seem to be low in the center of the country, the amount generated is higher than I expected. With independent companies offering different pricing models for consumers, I would think the number of installations would continue to grow. On my historic farmhouse in Southern Indiana, I don’t yet have solar installed, but stay tuned!